78290, San Luis Potosí, S.L.P., México. Se pueden descargar los preprints de la mayoria de mis publicaciones desde mi pagina en ResearchGate. Spectral properties of the respiratory signal during sleep apnea events: obstrusive and unobstrusive measurements. J. Ramirez-Elias, M. Ramirez-Elias, J. Acosta-Elias, G. Dorantes-Mendez, A. Alba, M.O. Mendez, G. Guerrero-Mora, J.M. Kortelainen, M. Tenhunen, 2019. International Journal of Modern Physics C. (accepted). A new Probabilistic Active Contour region-based method for multiclass medical image segmentation. E.R. Arce-Santana, A.R. Mejia-Rodriguez, E. Martinez-Pena, A. Alba, M. Mendez, E Scalco, A. Mastropietro, G. Rizzo, 2019. Medical & Biological Engineering & Computing. Vol. 57 (3): 565-576. Time-varying analysis of the heart rate variability during A-phases of sleep: healthy and pathologic conditions. G. Dorantes-Mendez, M.O. Mendez, A. Alba, L. Parrino, G. Milioli, 2018. Biomedical Signal Processing and Control. Vol. 40: 111-116. Detection of the sleep stages throughout non-obtrusive measures of inter-beat fluctuations and motion: night and day sleep of female shift workers. M.O. Mendez, E.R. Palacios-Hernandez, A. Alba, J.M. Kortelainen, M.L. Tenhunen, A.M. Bianchi, 2017. Fluctuation and Noise Letters. Vol. 16 (4): 1750033. Denoising of Raman spectroscopy for biological samples based on Empirical Mode Decomposition. F. Leon-Bejarano, M. Ramirez-Elias, M.O. Mendez, G. Dorantes-Mendez, M.C. Rodriguez-Aranda, A. Alba, 2017. International Journal of Modern Physics C. Vol. 28 (9): 1750116. Study of quadrature FIR filters for extraction of low-frequency instantaneous information in biophysical signals. V.E. Arce-Guevara, A. Alba-Cadena, M.O. Mendez-Garcia, 2017. International Journal of Modern Physics C. Vol. 28 (5): 1750065. Heart rate dynamics and their relation with the cyclic alternating pattern of sleep in normal subjects and NFLE patients. J.S. Gonzalez, G. Dorantes, A. Alba, M.O. Mendez, S. Camacho, M. Luna, L. Parrino, A. Grassi, M. Terzano, G. Milioli, 2017. Fluctuation and Noise Letters. Vol. 16 (2): 1750012. Spectral entropy analysis of the respiratory signal and its relationship with the cyclic alternating pattern during sleep.E. Reyes-Sanchez, A. Alba, M.O. Mendez, G. Milioli, L. Parrino, 2016. International Journal of Modern Physics C. Vol. 27 (12): 1650140. Analysis of A-phase transitions during the Cyclic Alternating Pattern under Normal Sleep. M.O. Mendez, I. Chouvarda, A. Alba, A.M. Bianchi, A. Grassi, E. Arce-Santana, G. Milioli, M.G. Terzano, L. Parrino, 2016. Medical & Biological Engineering & Computing. Vol. 54 (1): 133-148. Scaling Analysis of Heart Beat Fluctuations Data and its Relationship with Cyclic Alternating Pattern Data During Sleep. R. De Leon-Lomeli, J.S. Murguia, I. Chouvarda, M.O. Mendez, E. Gonzalez-Galvan, A. Alba, 2016. International Journal of Modern Physics C. Vol. 27 (7): 1650071. A consensus algorithm for approximate string matching and its application to QRS complex detection. A. Alba, M.O. Mendez, M.E. Rubio-Rincon, E.R. Arce-Santana, 2016. International Journal of Modern Physics C. Vol. 27 (2): 1650029. Robust rigid registration by scanning multiple phase correlation peaks. A. Alba, E.R. Arce-Santana, 2015. International Journal for Light and Electron Optics. Vol. 126 (24): 5115-5118. Phase correlation with sub-pixel accuracy: a comparative study in 1D and 2D. A. Alba, J.F. Vigueras-Gomez, E.R. Arce-Santana, R.M. Aguilar-Ponce, 2015. Computer Vision and Image Understanding. Vol. 137: 76-87. Phase-correlation guided area matching for realtime vision and video encoding. Alba, A., Arce-Santana, E.R., Aguilar-Ponce, R.M., Campos-Delgado, D.U., 2014. Journal of Real-Time Image Processing. Vol. 9, No. 4: 621-633. Registro de Imagenes Medicas Multimodales a Traves de Filtro de Particulas: Evaluacion y Nuevos Resultados. I. Reducindo Ruiz, E. Arce Santana, D.U. Campos Delgado, A. Alba, 2014. IEEE Latin America Transactions. Vol. 12, No. 2: 129-137. Un algoritmo de consenso para la búsqueda aproximada de patrones en cadenas de proteínas. A. Alba, M. Rubio-Rincón, M. Rodríguez-Kessler, E.R. Arce-Santana, M.O. Méndez, 2012. Revista Mexicana de Ingeniería Biomédica. Vol. 33, No. 2: 87-99. Efficient automatic classifiers for the detection of A phases of the Cyclic Alternating Pattern in sleep. S. Mariani, E. Manfredini, V. Rosso, A. Grassi, M.O. Mendez, A. Alba, M. Matteucci, L. Parrino, M.G. Terzano, S. Cerutti, A.M. Bianchi, 2012. Medical & Biological Engineering & Computing. Vol 50, Number 4: 359-372. Affine Image Registration Guided by Particle Filter. Arce-Santana, E., Campos-Delgado, D.U., Alba, A., 2012. IET Image Processing. Vol. 6 (5): 455-462. Electrophysiological auditory responses and language development in infants with periventricular leukomalacia. Harmony, T., Avecilla-Ramirez, G.N., Ruiz-Correa, S., Marroquin, J.L., Alba, A., Mendoza-Montoya, O., 2011. Brain and Language. Vol 119: 175-183. Morphology-Based Hypothesis Testing in Discrete Random Fields: A Non-parametric Method to Address the Multiple-Comparison Problem in Neuroimaging. Ruiz-Correa, S. Marroquin, J.L., Biscay, R.J., Alba, A., Ramirez, R., Armony, J.L., 2011. Neuroimage. Vol 56(4): 1954-1967. Classification and interactive segmentation of EEG synchrony patterns. A. Alba, J.L. Marroquín, E. Arce-Santana, T. Harmony, 2010. Pattern Recognition. Vol 43: 530-544. Image Registration Using Markov Random Coefficient and Geometric Transformation Fields. E. R. Arce-Santana, A. Alba, 2009. Pattern Recognition. Vol 42, Number 8: 1660-1671. Time-Frequency-Topographic Analysis of Induced Power and Synchrony of EEG Signals During a GO/NO-GO Task. Harmony, T., Alba, A., Marroquín, J.L., González-Frankenberger, B., 2009. Int. Journal of Psychophysiology. Vol 71, Issue 1: 9-16. Exploration of event-induced EEG phase synchronization patterns in cognitive tasks using a time–frequency-topography visualization system. Alba, A., Marroquin, J.L., Peña, J., Harmony, T., Gonzalez-Frankenberger, B., 2007. J Neurosci Methods. Vol 161, Issue 1: 166-182. Robust Image Segmentation Based on Superpixels and Gauss-Markov Measure Fields. A. Reyes, M.E. Rubio-Rincon, M.O. Mendez, E. Arce-Santana, A. Alba, 2017. 16th Mexican International Conference on Artificial Intelligence (MICAI 2017), pp. 46-52. Fluorescence Background Removal Method for Biological Raman Spectroscopy Based on Empirical Mode Decomposition. M. Leon-Bejarano, G. Dorantes-Mendez, M.G. Ramirez-Elias, M.O. Mendez, A. Alba, I. Rodriguez-Leyva, M.E. Jimenez-Catano, 2016. 38th Annual International Conference of the IEEE Engineering in Medicine and Biology Society (EMBC 2016), pp. 3610-3613. Experimental evaluation of rigid registration using phase correlation under illumination changes. A. Alba, E. Arce-Santana, 2015. 11th International Symposium on Visual Computing (ISVC 2015), LNCS 9474, pp. 151-161. Non-linear analysis of EEG and HRV signals during sleep. A. Martin, G. Guerrero-Mora, G. Dorantes-Mendez, A. Alba, M.O. Mendez, I. Chouvarda, 2015. 37th International Conference of the IEEE Engineering in Medicine & Biology Society (EMBC 2015), pp. 4174-4177. Evaluation of EEG signal during the A-phases of the Cyclic Alternating Pattern using Principal Component Analysis. M. Ramirez-Elias, V. Arce-Guevara, M.O. Mendez, A. Alba, 2015. 37th International Conference of the IEEE Engineering in Medicine & Biology Society (EMBC 2015). Heart Rate Variability in Cyclic Alternating Pattern during Sleep in Healthy and Nocturnal Front Lobe Epilepsy patients. G. Dorantes, M. Mendez, A. Alba, J.S. Gonzalez, L. Parrino, G. Milioli, 2015. 37th International Conference of the IEEE Engineering in Medicine & Biology Society (EMBC 2015), pp. 5944-5947. Relation Between Heart Beat Fluctuations and Cyclic Alternating Pattern During Sleep in Insomnia Patients. De Leon-Lomeli, R., Murguia, J.S., Chouvarda, I. Mendez, M.O., Gonzalez-Galvan, E., Alba, A., Milioli, G., Grassi, A., Terzano, M.G., Parrino, L., 2014. 36th International Conference of the IEEE Engineering in Medicine & Biology Society (EMBC 2014), pp. 2249-2252. On Separability of A-Phases during the Cyclic Alternating Pattern. Mendez, M.O., Alba, A., Chouvarda, I., Milioli, G., Grassi, A., Terzano, M.G., Parrino, L., 2014. 36th International Conference of the IEEE Engineering in Medicine & Biology Society (EMBC 2014), pp. 2253-2256. Characterization of the autonomic system during the cyclic alternating pattern of sleep. Gonzalez-Salazar, J.S., Alba, A., Mendez, M.O., Luna-Rivera, J.M., Parrino, L., Grassi, A., Terzano, M., Milioli, G., 2014. 36th International Conference of the IEEE Engineering in Medicine & Biology Society (EMBC 2014), pp. 3805-3808. Efficiency analysis of POC-derived bases for combinatorial motion estimation. Reyes, A., Alba, A., Arce-Santana, E., 2014. 6th Pacific-Rim Symposium on Image and Video Technology (PSIVT 2013). LNCS 8333, pp. 124-135. Optical Flow Estimation using Phase Only-Correlation. Reyes, A., Alba, A., Arce, E., 2013. 3rd Iberoamerican Conference on Electronics Engineering and Computer Science (CIIECC 2013). Procedia Technology 7, pp. 103-110. A Consensus Algorithm for Approximate String Matching. Rubio, M., Alba, A., Mendez, M., Arce, E., Rodriguez-Kessler, M., 2013. 3rd Iberoamerican Conference on Electronics Engineering and Computer Science (CIIECC 2013). Procedia Technology 7, pp. 322-327. Phase correlation based image alignment with subpixel accuracy. Alba, A., Aguilar-Ponce, R.M., Vigueras-Gómez, J.F., Arce-Santana, E.R., 2013. 11th Mexican International Conference on Artificial Intelligence (MICAI 2012), LNAI 7629, pp. 171-182. Nonlinear Analysis of the Change Points Between A and B Phases During the Cyclic Alternating Pattern under Normal Sleep. Chouvarda, I., Mendez, M.O., Alba, A., Bianchi, A.M., Grassi, A., Arce-Santana, E.R., Rosso, V., Terzano, M.G., Parrino, L., 2012. 34th International Conference of the IEEE Engineering in Medicine & Biology Society (EMBC 2012), pp. 1049-1052. A Novel Method to Assist the Detection of the Cyclyc Alternating Pattern (CAP). Tenorio-Orta, J.M., Alba, A., Mendez, M.O., Bianchi, A.M., Grassi, A., Arce-Santana, E.R., Chouvarda, I., Rosso, V., Terzano, M.G., Parrino, L., Reducindo, I., 2012. 34th International Conference of the IEEE Engineering in Medicine & Biology Society (EMBC 2012), pp. 3656-3659. Approximate String Matching using Phase Correlation. Alba, A., Rodriguez-Kessler, M., Arce-Santana, E.R., Mendez, M.O., 2012. 34th International Conference of the IEEE Engineering in Medicine & Biology Society (EMBC 2012), pp. 6309-6312. An Exploration of Multimodal Similarity Metrics for Parametric Image Registration Based on Particle Filtering. Reducindo, I., Arce-Santana, E.R., Campos-Delgado, D.U., Alba, A., Vigueras-Gómez, J.F., 2011. 8th International Conference on Electrical Engineering, Computing Science and Automatic Control (CCE 2011), pp. 879-884. A non-rigid multimodal image registration method based on particle filter and optical flow. Arce-Santana, E., Campos-Delgado, D.U., Alba, A., 2010. 6th International Symposium on Visual Computing (ISVC'10). LNCS 6453, pp. 35-44. Optical flow estimation with prior models obtained from phase correlation. Alba, A., Arce-Santana, E., Rivera, M., 2010. 6th International Symposium on Visual Computing (ISVC'10). LNCS 6453, pp. 417-426. Evaluation of Multimodal Medical Image Registration Based on Particle Filter. Isnardo Reducindo, Edgar R. Arce-Santana, Daniel U. Campos-Delgado, Alfonso Alba, 2010. 7th International Conference on Electrical Engineering, Computing Science and Automatic Control (CCE 2010), pp. 406-411. POC-Guided Area Matching Algorithm for Video Encoding. Ruth M. Aguilar-Ponce, J. Luis Tecpanecatl-Xihuitl, Alfonso Alba-Cadena Edgar Arce-Santana, 2010. 53rd IEEE International Midwest Symposium on Circuits and Systems, pp. 505-508. Image Registration Guided by Particle Filter. E. Arce-Santana, D.U. Campos-Delgado, A. Alba, 2009. 5th International Symposium on Visual Computing (ISVC'09). LNCS 5875, pp. 554-563. Phase-Correlation Guided Search for Realtime Stereo Vision. A. Alba, E. Arce-Santana, 2009. 13th International Workshop on Combinatorial Image Analysis (IWCIA'09). LNCS 5852, pp. 212-223. Visualization of dynamic connectivity in high electrode-density EEG. A. Alba, E. Arce-Santana, 2008. International Symposium on Visual Computing (ISVC'08). LNCS 5358, pp. 1040-1050. Premio al mejor artículo en Análisis y Visualización de Datos Biomédicos. Image Registration Using Markov Random Coefficient Fields. Arce-Santana, E., Alba, A., 2008. International Workshop on Combinatorial Image Analysis (IWCIA'08), LNCS 4958, pp. 306-317. Interactive segmentation of EEG synchrony data in time-frequency space by means of region-growing and Bayesian regularization. Alba, A. y Arce, E. Cuarto Congreso de Electrónica, Robótica y Mecánica Automotriz (CERMA 2007), Cuernavaca, México, Septiembre 25-28, 2007, pp. 235-240. Segmentación Automática de Imágenes de Resonancia Magnética Cerebrales en T1. M. P. Zamudio-Arteaga, F. A. Alba, M. O. Méndez, O. R. Marrufo, 2018. XLI Congreso Nacional de Ingeniería Biomédica (CNIB 2018). Analisis de Fractalidad de la Ocurrencia de las Fases A del Sueno. L. Alvarado-Contreras, M. O. Méndez-García, J. S. Murguía-Ibarra, A. Alba, H. González-Aguilar, 2018. XLI Congreso Nacional de Ingeniería Biomédica (CNIB 2018). Analisis multifractal del patron ciclico alternante del sueno. J. A. Alegría-Mancilla, M. O. Méndez-García, J. S. Murguía-Ibarra, A. Alba, H. Gonzalez-Aguilar, 2018. XLI Congreso Nacional de Ingeniería Biomédica (CNIB 2018). Uso del metodo de descomposicion empirica de modos para eliminar fluorescencia en espectros Raman de tejido biologico. F. Leon-Bejarano, M.G. Ramirez-Elias, M.O. Mendez, G. Dorantes-Mendez, A. Alba, 2017. XL Congreso Nacional de Ingenieria Biomedica (CNIB 2017). Sistema de apoyo para pacientes con discapacidad motriz mediante una interfaz humano-computadora controlada por movimientos oculares. B.L. Medina A.R. Mejia-Rodriguez, A. Alba-Cadena, 2016. XXXIX Congreso Nacional de Ingenieria Biomedica (CNIB 2016). A classifier based on Superpixels and Markov Random Fields for Multiple Sclerosis lesions on Magnetic Resonance Images. A. Reyes, A. Alba, E.R. Arce-Santana, I. Rodriguez-Leyva, 2016. XXXIX Congreso Nacional de Ingenieria Biomedica (CNIB 2016). Rastreo de movimiento de roedores usando vision computacional. C.A. Gomez-Vega, V. Ramirez-Medina, M.O. Mendez-Garcia, A. Alba, R. Salgado-Delgado, 2015. XXXVIII Congreso Nacional de Ingeniería Biomédica (CNIB 2015). pp: 196-199. Uso de entropia de Shannon para caracterizar la aparicion de las fases A durante el sueno NREM. S. Mendez-Elizondo, V. Arce-Guevara, H. Gonzalez-Aguilar, J. Castillo-Gonzalez, E. Palacios-Hernandez, M.O. Mendez, A. Alba, 2015. XXXVIII Congreso Nacional de Ingeniería Biomédica (CNIB 2015). pp: 119-122. On the selection of FIR bandpass filters for low frequency signals applied to A-phase analysis during sleep. V. Arce-Guevara, A. Alba, M.O. Mendez , 2014. XXXVII Congreso Nacional de Ingenieria Biomedica (CNIB 2014). Caracterizacion del sistema autonomo durante el patron alternante ciclico del sueno en sujetos sanos y con epilepsia. J.S. Gonzalez-Salazar, A. Alba, M.O. Mendez, J.M. Luna-Rivera, L. Parrino, A. Grassi, M. Terzano, G. Milioli , 2014. XXXVII Congreso Nacional de Ingenieria Biomedica (CNIB 2014). Relacion entre la Variabilidad de la Frecuencia Cardiaca y el Patron Ciclico Alternante del Sueno en Pacientes con Insomnio. R. de Leon-Lomeli, I. Chouvarda, M.O. Mendez, J.S. Murguia, E. Gonzalez-Galvan, A. Alba , 2014. XXXVII Congreso Nacional de Ingenieria Biomedica (CNIB 2014). An improved consensus algorithm for approximate string matching. M.E. Rubio-Rincon, A. Alba, E.R. Arce-Santana, M.O. Mendez , 2014. XXXVII Congreso Nacional de Ingenieria Biomedica (CNIB 2014). Deteccion del complejo QRS mediante busqueda aproximada de cadenas. M.E. Rubio-Rincon, M.O. Mendez, A. Alba , 2014. XXXVII Congreso Nacional de Ingenieria Biomedica (CNIB 2014). Variabilidad de la frecuencia cardiaca durante el patron ciclico alternante del sueno. G. Dorantez-Mendez, M.O. Mendez-Garcia, J.S. Gonzalez-Salazar, A. Alba-Cadena , 2014. XXXVII Congreso Nacional de Ingenieria Biomedica (CNIB 2014). Evaluacion de Potenciales Evocados Visuales con Estimulos de Diferente Intensidad y Color. J.A. Estrada-Castillo, A. Montoya-Rodriguez, M.O. Mendez, A. Alba , 2014. XXXVII Congreso Nacional de Ingenieria Biomedica (CNIB 2014). Analisis de Textura para la deteccion del Sindrome de Apnea Nocturna. L.B. Contreras-Chavez, G. Guerrero-Mota, M.O. Mendez, E.R. Palacios- Hernandez, A. Alba-Cadena, J. Kortelainen, 2014. XXXVII Congreso Nacional de Ingenieria Biomedica (CNIB 2014). Characterization of the autonomic system during cyclic alternating pattern in subjects with nocturnal frontal lobe epilepsy. Gonzalez-Salazar, J.S., Mendez, M.O., Alba, A., Luna-Rivera, J.M., Parrino, L., Grassi, A., Terzano, M., Milioli, G., 2013. XXXVI Congreso Nacional de Ingenieria Biomedica (CNIB 2013). Low Level Representation of Data for Visual Sensor Network. Aguilar-Ponce, R., Tecpanecatl-Xihuitl, J.L., Alba, A., 2011. Capítulo del libro "Visual Information Processing in Wireless Sensor Networks: Technology, Trends, and Applications", Li-minn Ang and Kah Phooi Seng (Eds.). IGI Global. Quantitative Electroencephalography in the Normal and Abnormal Developing Human Brain. T. Harmony, A. Alba , J.L. Marroquín, A. Fernández- Bouzas, G. Avecilla, J. Ricardo-Garcell, E. Santiago-Rodríguez, G. Otero, E. Porras-Kattz , and T. Fernández, 2008. Capítulo del libro "From Development to Degeneration and Regeneration of the Nervous System", Charles E. Ribak, Carlos Aramburo, Edward G. Jones, Jorge Larriva Sahd and Larry Swanson. Oxford University Press. Analysis and Visualization of EEG Event-Induced Dynamic Synchronization Patterns in Cognitive Tasks. Alba, A., Marroquin, J.L., Peña, J., Harmony, T., 2006. Technical Communication No I-06-05/08-03-2006 (CC/CIMAT). Analisis y caracterizacion de las fases-A del sueno. XVII Reunion de Neuroimagen. Centro de Investigacion en Matematicas, A.C., Guanajuato, Gto., Noviembre, 2015. Analisis de EEG y sus aplicaciones. Congreso Nacional de Ingenieria Electronica e Ingenieria Industrial. ITESCO, Coatzacoalcos, Veracruz. Septiembre, 2014. Vision computacional en tiempo real. Congreso Nacional de Ingenieria Electronica e Ingenieria Industrial. ITESCO, Coatzacoalcos, Veracruz. Septiembre, 2014. Taller de Sintesis de Sonido y Composicion Algoritmita en Puredata. VI Escuela Conjunta de Verano en Matematicas. Facultad de Ciencias, UASLP. Junio, 2014. Aplicaciones de la correlacion de fase. Seminario de Ingenieria Electronica, Biomedica y en Telecomunicaciones. Facultad de Ciencias, UASLP. Septiembre, 2013. Taller de Sintesis de Sonido y Composicion Algoritmita en Puredata. V Escuela Conjunta de Verano en Matematicas. Facultad de Ciencias, UASLP. Junio, 2013. Analisis de senales biomedicas y sus aplicaciones. 3er Encuentro de Telecomunicaciones y Analisis de Senales (ETAS 2012). Facultad de Ciencias, UASLP. Noviembre, 2012. Análisis de electroencefalogramas y sus aplicaciones. Escuela de Verano 2011 en Sistemas Biomédicos. Facultad de Ciencias, UASLP. Junio, 2011. Visión Computacional en Tiempo Real. 1er Taller de Circuitos y Sistemas. Facultad de Ciencias, UASLP. Enero, 2011. Estimation of prior models for efficient discrete optical flow methods. 2do Encuentro de Telecomunicaciones y Análisis de Señales (ETAS'2010). Facultad de Ciencias, UASLP. Septiembre, 2010. Segmentación de patrones de sincronía en señales de EEG. 1er Encuentro de Telecomunicaciones y Análisis de Señales (ETAS'2009). Facultad de Ciencias, UASLP. Septiembre, 2009. Sonificación binaural de mapas de disparidad. 1er Encuentro de Telecomunicaciones y Análisis de Señales (ETAS'2009). Facultad de Ciencias, UASLP. Septiembre, 2009. Visión estéreo eficiente mediante correlación de fase. 1er Encuentro de Telecomunicaciones y Análisis de Señales (ETAS'2009). Facultad de Ciencias, UASLP. Septiembre, 2009. A fast stereo matching algorithm based on phase correlation. Alba, A., Arce-Santana, E., 2009. VI Taller-Escuela de Procesamiento de Imágenes (PI09). Visualization of dynamic power and synchrony in high density EEG. Alba, A., Arce-Santana, E., Marroquín, J.L., Harmony, T., 2008. X Reunión de Neuroimagen. Binaural sonification of disparity maps. Alba, A., Zubieta, C., y Arce, E., 2008. V Taller de Procesamiento de Imágenes (PI08). Segmentación de mapas de amplitud y sincronía para el estudio de tareas cognitivas. Alba, A., Marroquín, J.L., y Arce, E., 2007. IX Reunión de Neuroimagen. EEG synchrony pattern segmentation for the exploratory analysis of cognitive experiments. Alba, A., Marroquín, J.L., y Arce, E., 2007. IV Taller de Procesamiento de Imágenes (PI2007). Representación multimodal de sincronía en EEG. Alba, A. Seminarios del Area de Electrónica, Facultad de Ciencias, UASLP. Febrero, 2007. Analysis and visualization of phase synchronization in EEG signals during cognitive tasks , 2007. (tesis de doctorado). Una revisión de métodos de síntesis de textura, 2003. Reporte de proyecto para un curso de Visión Computacional (en español). Generating music by fractals and grammars, 2001. (tesis de maestría). Eduardo Arturo Martinez Gonzalez. "Seguimiento de la mirada como instrumento para la evaluacion del campo visual". Doctorado en Ingenieria y Ciencia de Materiales. En proceso. Alejandro Reyes. "Segmentacion de imagenes de resonancia magnetica como herramienta para el diagnostico de enfermedades neurodegenerativas". Doctorado en Ingenieria Electronica. En proceso. Valdemar Arce Guevara. "Estudio de la sincronizacion cerebral durante las fases A del sueno". Doctorado en Ciencias de la Ingeniería. Julio, 2018. José Saul González Salazar. "Análisis multivariable y multisistema del patrón cíclico alternante (CAP) durante el sueno". Doctorado en Ingeniería Electrónica. Febrero, 2018. Ericka Reyes Sánchez. "Analisis de la senal respiratoria durante las fases-A del patron ciclico alternante del sueno". Doctorado en Ingenieria y Ciencia de Materiales. Marzo, 2017. Lina Rubi IpiÃ±aCampos. "Estimacion de flujo optico en imagenes con transparencia". Maestria en Matematica Aplicadas y Fisica Matematica. En proceso. David Galvan Hernandez. "Interfaz humano-computadora basada en un eyetracker para personas discapacitadas". Maestria en Ingenieria Electronica. Febrero, 2018. Miguel Eugenio Rubio Rincon. "Segmentacion de imagenes utilizando superpixeles y algoritmos de clasificacion". Maestria en Ingenieria Electronica. Diciembre, 2017. Eduardo Arturo Martinez Gonzalez. "Campimetria basada en seguimiento ocular". Maestria en Ingenieria Electronica. Noviembre, 2017. Salvador García García. "Adquisición y detección de potenciales evocados visuales para campimetría". Maestría en Ingeniería Electrónica. Julio, 2016. Alejandro Reyes. "Estimación de flujo óptico usando correlación en fase". Maestría en Ingeniería Electrónica. Feb, 2014. Jose Saul González Salazar. "Caracterización de la relación entre senales corticales y cardiovasculares en sujetos con epilepsia durante el sueno". Maestría en Ingeniería Electrónica. Dic, 2013. José Manuel Tenorio Orta. "Análisis de la microestructura del sueño". Maestría en Ingeniería Electrónica. Febrero, 2012. Bryan Louis Medina. "Visualizacion interactiva de imagenes volumetricas". Licenciatura en Ingenieria Biomedica. En proceso. Melisa Pamela del Rosario Zamudio Arteaga. "Segmentacion de imagenes de resonancia magnetica mediante operaciones morfologicas y campos markovianos de medidas gaussianas". Licenciatura en Ingenieria Biomedica. Septiembre, 2018. Juan Alberto Puebla Delgado. "Sistema de comunicacion utilizando vision computacional para infantes con paralisis cerebral". Licenciatura en Ingenieria Electronica. Diciembre, 2016. Ariel Montoya Rodriguez. "Clasificacion automatica de los tipos del sueno". Licenciatura en Ingenieria Biomedica. Julio, 2016. Miguel Delgado Salas. "Interfaz para deteccion de gestos faciales haciendo uso del dispositivo Kinect 360". Licenciatura en Ingenieria en Telecomunicaciones. Julio, 2016. Salvador García García. "Diseño de una interfaz gráfica para la manipulación de señales EEG usando dispositivos móviles". Licenciatura en Ingeniería Electrónica. Mayo, 2013. Alejandro Reyes. "Diseño de filtros robustos para imágenes vectoriales". Ingeniero Electrónico. Septiembre, 2011. José Manuel Tenorio Orta. "Detección automática del patrón alternante cíclico del sueño". Ingeniero Electrónico. Diciembre, 2010. Jesús Rosas Hernández. "Lenguaje para representar Máquinas de Turing y simulador gráfico". Ingeniero Electrónico. Diciembre, 2010. José de Jesús Ramírez García. "Síntesis de sonido mediante DSP". Ingeniero Electrónico. 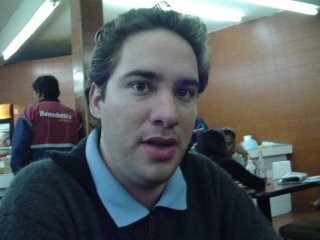 Julio, 2003. Manuel Antonio Ochoa Alfaro. "Visualización de datos volumétricos". Ingeniero Electrónico. Julio, 2003. Rolando Solís Macías. "Reconocimiento de vocales mediante redes neuronales". Ingeniero Electrónico. Junio, 2003. Oscar Daniel Velázquez Nieto. "Diseño de un sistema de bases de datos para el control escolar de la Facultad de Ciencias". Ingeniero Electrónico. Enero, 2003. José Angel González Fraga. "Laboratorio virtual de mecánica y electrostática programado en Java". Ingeniero Electrónico. Agosto, 2002.